The big top brands of technology and gadgets cannot stay back and go on any halt, they keep on experimenting with new cellular features, advancement and touch systems therefore every now and then when the launch of a new smartphone comes nearer the speculations become so evident and people become ready to invest mighty on the phones. Apple and Samsung has always been into a cut throat competition. They both come the same year with some breath bouncing sets and enthrall its fans. Sometimes you cannot even decide between both the brands and want to get your hands on both of them. But alas, this cannot happen, nobody is that richer to invest money at the same time on two phones. Samsung has its own standard, which has been the same without any change. They come up with slight modification and evolvement in the sets, with enhanced features, a better camera and a nicer body. However they have the premium Smartphones and Notes that you cannot resist. They come in the beautiful colors to make an easy choice out of all. 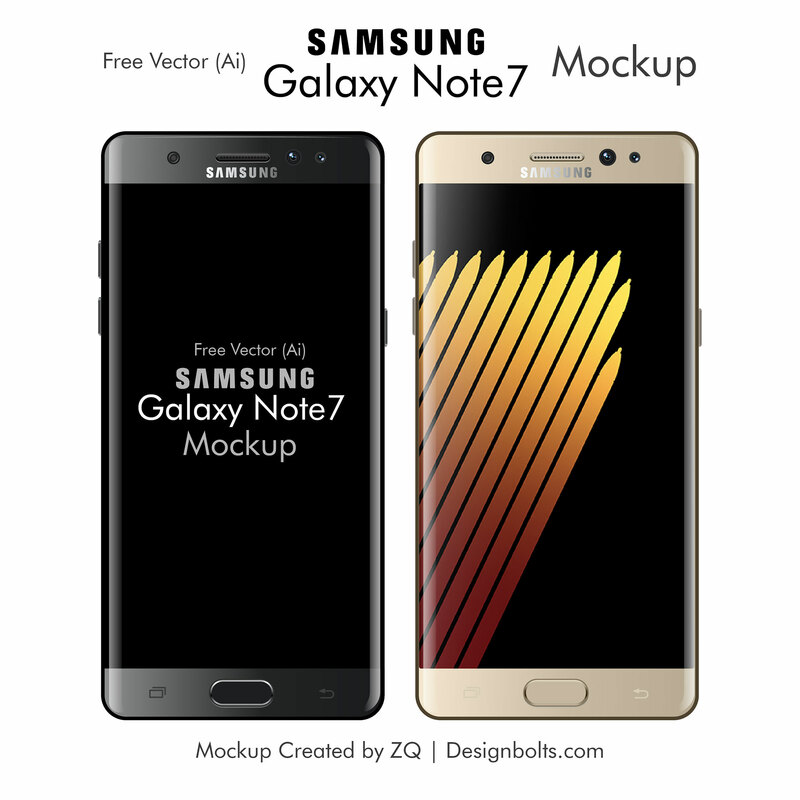 Let us talk about the post of today which is all about free Vector Samsung Galaxy Note 7 mockup , it is recently launched with some stunning features that I want to draw your attention to. Note 7 is as bigger as you ever dreamed of, with a clear view, fantastic bigger display to handle all its amazing tantrums of technology. This 5.7 inches Note is to die for, it comes with the sleek S pen to give a next level experience to touch technology. The body of Note 7 is seamless, S pen works smooth if you want to draw out your ideas or to take notes abruptly. It is an ultimate entertainment package where you can play HDR videos, take professional photos & much more other than this. So in case you want a bigger space it can deal up to 256-GB storage vide micro SD card to give you peace. What more would anyone want? Have a look at this mockup and use it in your projects. Subscribe us for more art, tech and design posts, we try to bring freebies before you to accommodate you by all means, here we go!